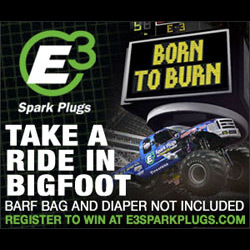 TMB TV is presented by E3 Spark Plugs! I want to watch this live! i wonder who won the freestyles. they never tell you. therewas a few problems throught out that weekend. grave digger was suffering electrical problems on friday. brurtus furthere destroyes that body after its damaged by chris at the buck in quarryville in an amazing save. spidermans body was allready severly damaged from a roll in hagerstown during the saturday night show and was completely destroyed here. i had a feeling it was going to break during all those pogos. Okay Saturday Night’s final round was just as good too.